I don’t know about every craft the U.S. sends into orbit, nor am I familiar with all of the missions, but I do keep a pretty close watch on space news. Thus, I’m pretty surprised to learn that the U.S. Air Force has a space plane that’s been in Earth orbit for nearly 500 days. The X-37B plane, which looks like a much smaller version—roughly 25% of the size—of a typical space shuttle, is carrying out a classified Orbital Test Vehicle 3 mission. It’s unclear what that means, given that it’s classified, but this is the third trip to the cosmos for the unmanned vehicle, which launched in December of 2012. In March, the shuttle took the title for the longest spaceflight. It’s also the world’s smallest robotic space plane. The solar-powered, reusable craft, manufactured by Boeing, was designed for NASA back in 1999, and was kicked over to the Department of Department—to DARPA, to be exact—five years later. 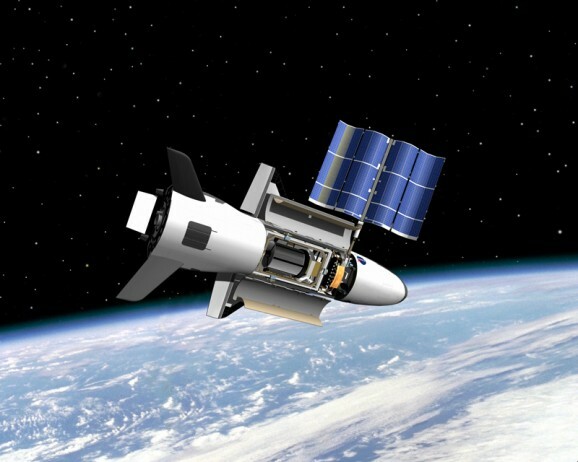 Now the Air Force Rapid Capabilities Office runs the X-37B program. After successful drop tests, the first launch was in April 2010, followed by another in March 2011. The space plane launches from an Atlas 5 rocket, and both of the previous efforts were successful, ending with the automatic return and landing at Vanderberg Air Force Base. The X-37B has a 7-foot by 4-foot payload bay, which carries…I have no idea. Something classified, though. It’s tough to speculate on what that might be, or the ultimate goal of the missions, but the duties of the Air Force Rapid Capabilities Office may provide enough information to hazard some guesses. The unit generally “expedites development and fielding of select Department of Defense combat support and weapon systems by leveraging defense-wide technology development efforts and existing operational capabilities.” Essentially, it gathers intelligence and carries out testing, which may be, at least in broad terms, what the X-37B is doing. At a House Armed Services Subcommittee on Strategic Forces meeting earlier this month, the U.S. military talked about the need to gather and analyze satellite intelligence about any threats, including inference with satellite operations, which is fairly similar to the goals stated in the recently declassified Geosynchronous Space Situational Awareness Program .